The Australian Marine Environment Protection Association aims to inspire students of all ages to engage in education and actions to raise the awareness of Australia’s marine environment. Free resources for teachers, students, posters, website education programs, teacher curriculum materials, student activity sheets, Free DVD, Welcome to Australia protecting the marine environment. The Australian National Maritime Museum produces educational resources and programs for school children K-12 including lots of fun guided tours and workshops. The Bureau of Infrastructure, Transport and Regional Economics (BITRE) provides economic analysis, research and statistics on transport issues and issues affecting regional Australia. A resource for finding out about the container shipping industry and how important it is to your daily life – from the clothes you wear to the food you eat. The site is intended as a gateway for distributing information about the Court’s admiralty and maritime jurisdiction, practice and procedure, and as a research tool covering admiralty-related information internationally. Student and teacher resouces for primary school students and well as stories and games. Play Time Pirates or read about the adventures of Trim the ship’s cat. This site provides basic information about the shipping industry, its contribution to the world economy, safety and environment as well as links to other sources of information such as the International Chamber of Shipping, IMO and many other useful links. Welcome aboard the REGINA MÆRSK. The virtual reality tour offers you a unique opportunity to gain a vivid insight into the vessel and its capabilities. Navigate 360 degrees and zoom in and out as you explore one of the world’s largest container vessels. The Australian shipping industry is large, complex and diverse. It integrates into industry and commerce both in Australia and in the rest of the world. There are 26,000 ship port calls involving over 3000 different ships at 70 Australian ports each year to exchange 580 million tonnes of cargo with a value in excess of $A190 billion. The work of the ships and all the services and people involved in supporting the ships trading in and out of Australia is fundamentally vital to the Australian economy. Ships carry 99.5% of Australia’s trade by volume and 74% by value. The Australian end of the international maritime trading industry directly employs over 50,000 persons in Australia. Areas of employment include, among others, ship managers, agents, port services companies, stevedores, insurance and finance, banking, freight forwarding, customs brokerage, port managers, maintenance and repair of ships and marine equipment and the statutory authorities engaged in regulating the maritime industry. The Australian shipping industry should not be seen as just that section of shipping that relates to Australian ownership and crewing of Australian flagships. Approximately 35 ships lifting approximately 2.0 million tonnes of intrastate, interstate and international cargo represent this section of the industry. Australian ships represent about 70% of Australian coastal cargoes and 2% of Australia’s international cargoes. The rest of Australia’s overseas trade is carried by foreign owned vessels. As the availability of Australian flagged ships reduces more use is being made of foreign flag vessels operating with a single voyage permit to carry coastal cargoes. There are in addition to the above figures some thousands more people employed in the small intrastate commercial vessels sector, in building, maintaining, crewing and selling the services of those small commercial vessels. The world merchant fleet consists of approximately 90 000 ships aggregating 560 million GT (Gross tonnes), if ships of 100 GT and upwards are counted. The world’s major cargo fleet of 46,500 ships aggregates to 530 million GT. Because of its complexity and diversification it is difficult to get a snapshot of the size and significance of the shipping industry. One way to view the industry is to look at its two major components. There is the commercial component that involves managing ships, agency representations of ships, and services to shipping such as industry bodies, marine insurance, maritime law, maritime education and ship broking and equipment leasing. There is the logistics and operations component that involves cargo services such as packing cargo, loading and unloading ships, storage and movement of goods before they are released into industry generally. The nature of services in the maritime industry varies with the types of ships and cargoes involved, such as dry bulk cargoes, tanker cargoes, unitised cargoes and containerised trades. Another way of looking at the maritime industry is to break the cargo that moves into major commodity groups and look at the volumes and values of the cargoes and the ports that service those cargoes and ships. The term “bulk” is a reference to homogeneous cargoes; usually dry cargoes, such as cereal grains, coal, ores and wood chip. The ships are usually loaded via shore based conveyor belts and discharged by shore-based grabs. Bulk ships may be very large and carry up to 300 thousand deadweight tonnes out of Australian ports. Ships engaged in bulk trades are often chartered (leased) for one or more voyages to move large consignments of product between a small number of ports. Goods carried in bulk trades tend to be low value added products. Liquid cargoes such as crude oil and petroleum product are carried in special tanker ships. Modern tankers are double hulled and usually have two longitudinal divisions and many transverse divisions to create a number of cargo tanks. Because of the nature of the cargoes carried stringent fire safety precautions are adopted on tankers. Like dry bulk ships, tankers commonly operate on charter arrangements. In addition to larger ships in the order of 2 – 300 thousand tonnes deadweight capacity involved in the import of overseas crude oil a number of smaller vessels of approximately 80 thousand tonnes deadweight capacity are used between Australian refineries and other Australian ports to distribute petroleum products. Passenger ships connecting Australian and foreign ports are engaged in cruising operations. A limited number of smaller passenger carrying vessels operate between Tasmania and Mainland ports, serving traveling passengers, cars and some freight. Some ships are designed to carry unitised cargo and break bulk cargo. Unitized cargo usually consists of cargo packs that have been made up from smaller packages for efficiency of handling. Often these ships are loaded by the roll on roll off method using a ramp that connects them to the wharf when in port and large fork lifts and truck trailers to load and discharge the cargo. These ships often carry containerised cargo as well as break bulk cargo such as machinery or newsprint rolls. There are a limited number of ships built to carry particularly heavy, large or awkward lifts. Included in this class of ships are some that can submerge their main deck in order to load their usually one off cargo.Other ships are modified or purpose built for the carriage of livestock. Australia has had great successes in the export of livestock, including exporting camels to Middle Eastern countries.A common example of a specialised ship seen in Australian ports is the car carrier. These have been likened to floating multi story car parks and might carry up to 6 000 sedan cars or mixes of sedan cars, light commercial vehicles and partially built up vehicles.Liner Services Liner ships are vessels that are engaged in servicing a fixed repeated route, usually on a scheduled basis. Increasingly since the 1960’s and now almost exclusively, these ships carry containers. Mostly they rely on shore based portainer cranes to load and discharge their containers at dedicated container terminals. The cargoes carried in containers tend not to be homogeneous bulk cargoes but rather higher value added manufactured products and foodstuffs and primary products. Specialised containers allow for the carriage of hard frozen and chilled cargoes and other products that might need a purpose-designed container. A feature of liner shipping is that ship operators usually cannot afford sufficient vessels on their own to give the importing and exporting market the frequency of sailings that the market needs. To accommodate the market ship operators tend to need to cooperate with each other in cross chartering of container space arrangements so that each operator is able to offer to the market the number of sailings shippers demand. In the 19th century, and after the advent of steamships which greatly increased supply of shipping capacity compared to sailing ships and, in response to market demands for scheduled services and predictability in freight rates, groups of ship operators in liner trades set common tariffs and to set schedules that serviced the particular trade in both high and low freight seasons. This inhibited the operator’s traditional ability to place vessels around the world in response to seasonal factors that dictated full loadings and high freight rates. It also required the ship operators to cooperate with their competitors in a way that they had not done in the past. In Australia the development of a common freight tariff would ordinarily be seen as offending restrictive business practice the Trade Practices Act (TPA). Because successive governments and regular reviews of arrangements have endorsed the desirability of conference arrangements, Part X of the TPA allows for the functioning of shipping conferences and similar organisations such as Discussion Agreements and Consortia and provides some checks and balances. The principal checks are the requirement to negotiate with the Peak Shippers Associations, represent users of export and import shipping services and to register with the Federal Government agency details of agreements reached and tariffs set. As well as conference carriers there are ship operators who function outside the conference group. The presence of non-conference operators adds to competition in the freight markets. Just how firmly shippers and ship operators adhere to the common tariffs vary from time to time depending on market forces. The expression “ship owner” is probably misleading as most shipping companies need to finance their vessels on long term arrangements and so actually charter their vessels from the finance houses. Alternatively they may charter in vessels from other owners on long term (several years) arrangements to service their needs in the freight market. The ship operating company will usually be based in their port of incorporation, or homeport, and be represented by agents at their ports of call. These are firms who make it their business to manage the crewing and possibly the repairs and maintenance of vessels for several ship operators. Managers tend not to be involved in the commercial aspects of cargo solicitation or chartering, but rather in the ship husbandry functions mentioned. In ports of call away from the ship operator’s homeport agents may be appointed to manage ship husbandry functions as well as cargo solicitation. In the husbandry function the agents will attend to the needs of the visiting ship, such as organizing crew changes, organizing support services such as pilots, tugs, lines launches, communications, medical needs of the ship, provisioning and so on. For providing this service the agent might be paid a retainer plus out of pocket expenses. The same or another agency company may be retained to manage the distribution of inwards cargo and acquisition of outwards freight. For providing cargo services it is common for the agent to be paid on a commission basis, plus expenses. Alternatively the ship operator may set up a branch structure to attend to the above functions, particularly in liner service operations. In the case of liner ships the more common arrangement is a single agency to attend to husbandry and cargo functions, whereas in bulk and tanker shipping it is not uncommon to retain an agent for husbandry functions and use different agents for cargo functions, depending on the commercial and chartering issues involved. International and interstate coastal shipping operate in a complex legal environment. The problem faced by shippers and ship operators alike is that their activities necessarily put them within the ambit of more than one legal jurisdiction. Partly for this reason a number of UN International Maritime Organisation (IMO) conventions and codes have come into force along with the relevant conventions of other UN organisations. In addition national legislation and sometimes defacto industry standards coming from the work of non-government oganisations dictate practices. The IMO has over seventy major conventions affecting the Australian maritime industry and affecting shipping. Below are mentioned some few of the major conventions and codes of the IMO. This requires designated authorities of contracting governments to conduct inspections of their own flag and of foreign flags in their ports to promote cooperation with the safety and environmental protection objectives of the IMO. The Australian Maritime safety authority (AMSA) is the organisation in Australia that administers Australia’s obligations under PSC. This sets out standards relating to safety construction and fittings and crewing of ships. Breaches of SOLAS are matters that might be dealt with by PSC inspectors. This code is about the preparation and packaging of cargo goods that may be dangerous in some manner in transit. It is also about the stowing of these goods on ships. It is also about ensuring that the shipper who commences the shipment process notifies others in the transport chain of the nature of the goods being shipped. Other parties in the transport chain are required to pass on the information about dangerous goods in transit. In road and rail transport in Australia the movement of dangerous goods is controlled by the Australian Dangerous Goods Code. Fortunately the two codes harmonise. There is an Australian standard covering the handling of dangerous goods on wharves. This sets outs standards and practices for ships to comply with in matters such as the dumping of garbage and other rubbish and oils and residues in the seas. MARPOL in Australia is taken up in Commonwealth legislation and repeated in State legislation to cover all waters administered by Commonwealth and State authorities. This requires safe working practices for the protection of persons and the marine environment. Ship operators are required to develop standard operating procedures and exceptions reporting regimes particularized to each ship. Ship operators are also required to appoint a Designated Person Ashore (DPA) with a brief to manage the fleet’s exception or non-conformity reports and to brief senior management on them. ISM became compulsory for all ships over 500 Gt in 2002. This Code, which is an amendment to SOLAS, will became effective on 1st July 2004. It has methodological similarities with the ISM code. Ships and port facilities are required to conduct a security risk assessment and based on that assessment, develop a security plan that addresses issues specific to the ship or port facility having regards to the nature and area of operations and the personnel involved. It is unusual for IMO to intrude into shore facilities and in the case of ISPS only seeks to do so as far as security matters are concerned and then only to the least distance ashore where boundary protection and control can be established. A port facility, such as a container terminal, or tanker berth or bulk loading facility or single Point Mooring etc in terms of the ISPS Code only becomes a port facility because it has a wet interface with ships over 500 GT engaged in international trades or with ships which share berths etc with such ships. ISPS requires the appointment of Company and Ship Security Officers and Port Facility Security Officers charged with a statutory duty to implement ISPS. The Australian government, through the Department of Transport and Regional Services (DOTARS) is bearing some costs to implement ISPS. Maritime industry participants such as ports, port facilities and ship operators and other organsiations operating on the waterfront are required to fund their part of initial and ongoing compliance. There are unresolved issues of principle about who bears the costs of implementation and how costs might be passed on. Commonly liner cargo is carried under Bills of Lading where the 1924 Hague-Visby rules apply, albeit rules recognised by and modified by national legislation. The International Chamber of Commerce has drafted ”Incoterms” that relate to some of the terms and conditions of the contract of sale of goods in international trade, including where risk passes from seller to buyer etc. While Incoterms are not part of the contract of affreightment, they impact on how the business of shipping is done. In Australia there is an Admiralty jurisdiction and the Federal court has wide ranging powers to deal with most matters of a maritime nature and any of the maritime statutes such as Carriage Of Goods By Sea Act (COGSA) 1998 (Cwth) and the Commonwealth Navigation Act. It is not compulsory to insure goods in transit, but obviously desirable to do so. When merchants insure their goods in transit this is commonly referred to a “marine insurance”. When ship operators insure against third party claims, such as damaged cargo claims, it is common for ship operators to form Protection and Indemnity Clubs (P&I). These are mutual arrangements where the operators forming the club estimate their exposure and then seed fund the club to run its operations. The rules vary from club to club, but generally an operator will seek agreement from the club representative that a given claim may be paid by the club and fund the claim directly and later claim reimbursement from the P&I club. Where the ship operator wishes to insure the ship asset the operator will buy “hull insurance “ from an insurer. The ship will normally be “classed “with a classification society and the insurer will be guided in part by the class ”status” issued by the classification society. These are private oganisations, operating internationally, who make it their business to supervise the building and safety fit out of ships according to their sets of rules. They may then continue to survey the ship through its lifetime and continue to issue documents of class that attest to the ships standards. 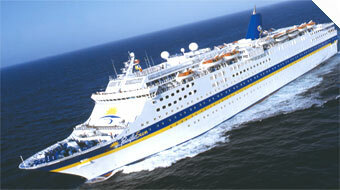 Governments inspect and license their flag ships to operate. Most governments will recognise appropriate certificates issued by selected classification societies and then not duplicate inspections. Customs has several roles. It is a revenue collection agency for the Commonwealth in its role for the collection of fees and charges and duties on some goods moving in and out of Australia. It also polices the movement of goods that may be special in some way, such as banned and prohibited items, or goods that require permits from other agencies in order to move. When goods are free to leave the country Customs issues the all-important ECN (Export Clearance Number). Customs checks ships manifests and reports summary statistics to the Australian Bureau of Statistics. ACS works closely with quarantine and immigration authorities. Customs also plays an important role in border protection. Customs uses a IT based system, known as ICS, (Integrated Cargo System). The intention is that all the parties involved in the movement of goods, inwards and outwards, will have secure access, as appropriate, to enter or download import and export data pertinent to their roles. Parties involved include those in the transport chain, such as ACBPS, AQIS and shippers, customs brokers, carriers, agents and stevedores. The system will be progressively implemented over the next few years. DAFF has a primary brief to ensure that banned flora and fauna do not enter Australia to the detriment of native flora and fauna and to the detriment of agricultural and forestry products and general health standards in Australia. They also seek to prevent prohibited exports such as native fauna. DAFF, often in cooperation with DAFF select which shipments they may wish to inspect. Commonly referred to as ”Immigration”, exercises controls on the movement on foreign crews entering Australia on ships, and crew members in transit to join ships. AMSA generally implements IMO requirements and regulates Australian ships in terms of safety and protection of the marine environment. AMSA is also involved in Australia’s international Search and Rescue Services, which covers an area approximately 11% of the globe. AMSA is also the authority for licencing Austalian mariners and assessing foreign qualifications for seafarers. AMSA implements the Port State Control Convention. Foreign flag vessels visiting Australian ports are subject to Australian law as are Australian ships. Civil authorities exercise the same jurisdiction with respect to visiting ships as they might in their work on shore. Ports in Australia are now mostly privatised or corporatised. Ports have responsibilities relating to safe navigation within the port and to safe practices on wharves within their jurisdiction. Which is Australia biggest port? The answer to this question might be measured in numbers of ship visits, the tonnages exchanged, the value of cargo handled or some other measure. It should be noted that trade fluctuates and so the ranking of ports on any given scale may vary from period to period. There is a general correlation between bulk loading ports and high tonnage figures on the one hand and higher value added containerised goods and the value of goods exchanged on the other. There is some overlap between the commercial and management parties on the one hand and the operations and logistics parties on the other hand. Which parties are involved will in part depend on the type of shipping, e.g. bulk, tanker, specialised or liner, is involved. Each sector has its specialisations and complexities. The parties who import and export might be referred to as shippers or merchants. It is their demand for international transport services that makes the Australian maritime industry so important to Australia’s economy. After the merchants have packed their goods, road and rail services convey the goods to and from the port. Ship operators and their agents will have been working closely with the merchants in the booking of space and providing details of schedules and advice on where to present cargo. Some shippers can work in full container lots (FCL) and hence can pack and unpack containers at their own factory or warehouse or depot. Other shippers, for reasons of convenience, or because they ship in small, less than container lots (LCL) may choose to use a contractor to undertake their pack and unpack services. This work is often undertaken by freight forwarders. A basic 6.01 metre (twenty foot) container can hold about 32 cubic metres of cargo, or 24 tonnes, depending on the design specifications of the container. Road and rail carriers specialising in shipping operations convey goods between the wharves and the merchants, or depots or freight forwarders’ premises. Rail wagons and road vehicles used to convey shipping containers require special fitting to do so safely. Stevedoring companies load and unload ships. In the liner/container trades they operate container terminals. They pre receive cargo before the ship arrives and hold cargo for limited periods for delivery after the ship has departed. The stevedores work in close cooperation with ship operators and their depots, with road and rail service providers and the various regulatory authorities. In the last decade there has been much change on the Australian waterfront, with continuing automation and mechanization, increases in loading rates and reductions in staffing levels. On average Australian port operators are able to load ships at the rate of about 28 to 30 containers per hour per crane. Having regard to the size of the container exchange, the ship size and configuration and the amount of incidental repositioning of cranes the actual cargo handling figures may vary from example to example. Among the ports those serving bigger ships with higher throughputs tend to have higher handling rates than those ports serving smaller ships, with shorter runs per hold and more shifting of portainer cranes. In liquid and dry bulk ship operations the staff engaged in loading and unloading operations may not describe themselves as stevedores in the same way as those involved in container and break bulk trades might. The industry sector might describe itself as a mining or refining company, rather than as a stevedoring one. In the case of liquids and gas in bulk and dry bulk cargos such as grains and minerals the process is different. Those products are generally piped or moved by conveyer belt for export loading, but it needs to be noted also that some bulk commodities are transported considerable distance by dedicated bulk rail to a port for stacking and eventual loading into ships. It is a feature of shore-based bulk handling that far fewer people are needed to handle homogeneous bulk cargoes, both in loading and in discharging. In recent decades ships have been subject to the same forces of aggregation, technology changes and reduced staffing, as have other parts of industry. In 1960 a cargo liner may have lifted 10 to 12, 000 deadweight tonnes of cargo, steamed at 14 knots (26 km/h), carried a crew of forty odd persons and spent up to fifteen days in each major Australian port. A modern container ship serving major Australian ports might lift 4,000 twenty foot/six metre containers and might stream at 20 knots (37km/h), carry a crew of about 20 persons and spend fifteen hours in port. Such a ship would cost relatively more than its predecessor and require a larger dedicated shore based infrastructure to assist its cargo work. In 1950 a world service tanker might have lifted perhaps 15 000 tonnes deadweight cargo in an average sized ship. Today 310 000 tonne deadweight capacity ships are not uncommon and the largest tanker built is able to lift 574 000 tonnes of cargo. Coastal tankers distributing refined products around the Australian coast might have a deadweight lifting capacity of 60 to 80 000 tonnes deadweight capacity. The expression “deadweight” refers to the mass tonnes that a vessel is able to carry. The ship operators business in liner trades is subject to fluctuating demand, sometimes seasonally driven and sometimes by other economic factors with varying lead times. It is particularly difficult for the ship operator to achieve the optimum distribution of empty containers in ports around the world in anticipation of the exporters demands. To help solve this logistics problem ship operators will enter into short and long term leasing arrangements with container leasing firms, businesses who let out containers to ship operators. Container leasing is a complex logistical exercise, made difficult by varying pick up and drop-off rights and surcharges in various ports, dependent on the leasing company’s forecasts of their future demands. There are approximately 20 million containers in world services completing 220 million traffic movements per annum. 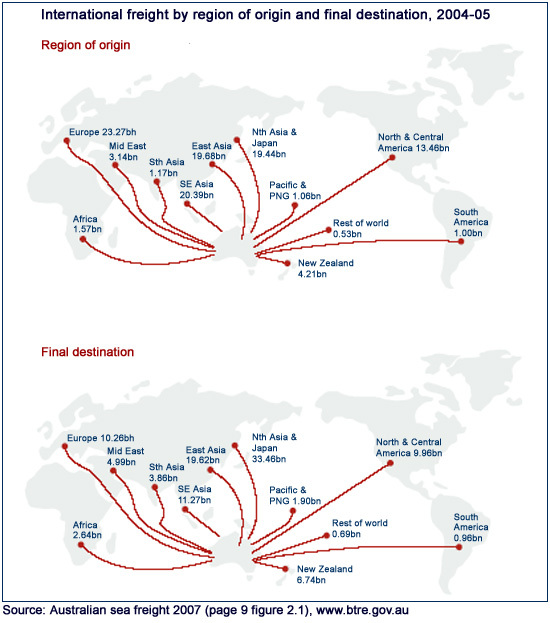 In Australia’s five main container ports 3.8 million traffic movements per annum occur, or 1.7% of the world figure. In year 2000 the average value of an imported tonne of cargo was $1470, and the average value of an exported tonne of cargo was $196! This underlines the fact that Australia tends to import high value added products and export low value added products. The International Chamber of Shipping (ICS) is the international trade association for merchant ship operators, it represents the collective views of the international industry from different nations, sectors and trades. Members comprise of national shipowners’ associations representing over half of the world’s merchant fleet. A major focus of ICS activity is the International Maritime Organization (IMO) ­the United Nations agency with responsibility for the safety of life at sea and the protection of the marine environment. ICS is heavily involved in a wide variety of areas including any technical, legal and operational matters affecting merchant ships. The Chamber is unique in that it represents the global interests of all the different trades in the industry: bulk carrier operators, tanker operators, passenger ship operators and container liner trades, including shipowners and third party ship managers. ICS has produced a short DVD film – International Shipping: Life Blood of World Trade – to explain the importance of shipping to the health of the world economy, and to convey the message that shipping is safe, clean and comprehensively regulated. The film also stresses the vital need for global regulation for a global industry. In addition to being used with captive audiences of policy makers, the film can be used as a tool at exhibitions and in careers talks to young people.